Right after that, Delta and Naruto start fighting. 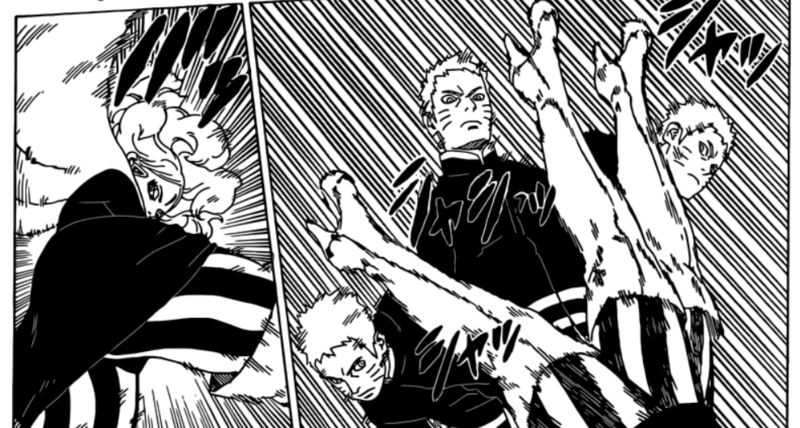 Delta starts with her strong kicks but Naruto easily dodges them all. Naruto grabs her leg and slams her right into the ground. Without wasting any time, Naruto tries to end it with the usual Rasengan but to his surprise, Delta’s right eye absorbs the whole jutsu. Her eye is just like an affordable rinnegan? Are they selling rinnegans now? That thing looks really useful! Both Boruto and Naruto are surprised but Kawaki immediately tells them it’s a specially made ‘Eye’ with a lot of different abilities. Naruto asks Delta if it’s a scientific ninja tool but he’s interrupted as a spike suddenly comes out of the ground. It is shown that Delta’s right leg is buried deep into the ground and it’s scientific ninja tool as well. It seems like this whole Kara organization is made up of scientific modified monsters like Kawaki. Then Delta reveals that her legs are just like a hoof. In simpler terms, legs like a horse or a goat. 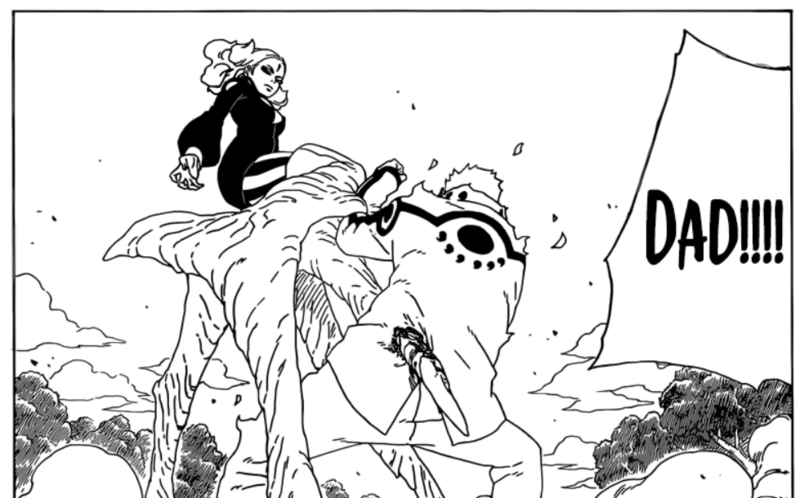 Delta again starts fighting Naruto while Naruto suddenly goes into one of his Chakra modes to block her kicks. Delta’s leg partially transformed again which helped her hold herself up in midair with a few grounded spikes. One of the spikes stabs right through Naruto’s lower left abdomen. Naruto uses his chakra-formed arms to try and grab her. Did Boruto Just Reveal The Return Of Jiraiya!? Kishimoto Regrets Creating Sakura And Explains Why! Naruto Creator Kishimoto Finally Explains Jiraiya’s Death & The Reason Behind It! Next story Dragon Ball Game – Project Z Trailer Released – Determination, Despair, and Hope! Previous story Boruto Chapter 32 Release Date & Spoilers – Naruto vs Delta Result!